Tunisia's dinar currency has fallen to record lows versus the euro and the US dollar this week as weaker exports, lower investment and a plunge in tourism revenues have eroded the country's foreign reserves. The dinar traded at 2.47 against the euro and 2.13 against the dollar on Wednesday and on Thursday was at 2.43 versus the euro and 2.16 against the dollar, according to central bank figures. The government was expected to announce new measures on Monday aimed at stabilising the currency. The North African state's tourism industry has been shattered by two major Islamist militant attacks on foreign visitors last year. "The record drop in the value of the dinar is caused by lower exports and a lack of investment that have lowered foreign exchange reserves," central bank director Chedli Ayari told reporters in parliament on Wednesday. He said the central bank would not interfere to halt the slide in the dinar because "the level of reserves is still average... and reflects the reality of the Tunisian economy." Exports fell 2.6 percent during the first five months of the year while foreign direct investment dropped 5 percent to $268 million in the same period compared to a year earlier, according to government statistics. Tourism, which comprises 8 percent of GDP and is a key source of foreign revenue, has been struggling. Islamic State gunmen attacked the Tunis Bardo museum and a Sousse beach hotel packed with tourists within a 3-month period last year, prompting many tour operators to suspend visits to the North African country. Tunisia's government is currently trying to push through reforms and some austerity measures to curb its deficit, among the measures demanded by international lenders such as the International Monetary Fund and the World Bank. Government spokesman Khaled Chaouket said officials would next week announce measures meant to arrest the fall of the dinar including commerce ministry initiatives. Some analysts expect these to include restrictions on luxury imports. 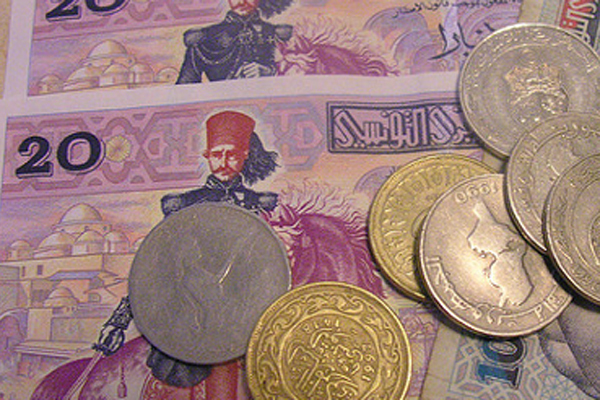 The weakened dinar may boost smaller local exporters by making their products cheaper abroad, but could also make debt service payments tighter and widen the deficit if the government does not act, said local financial risk expert Mourad Hattab.